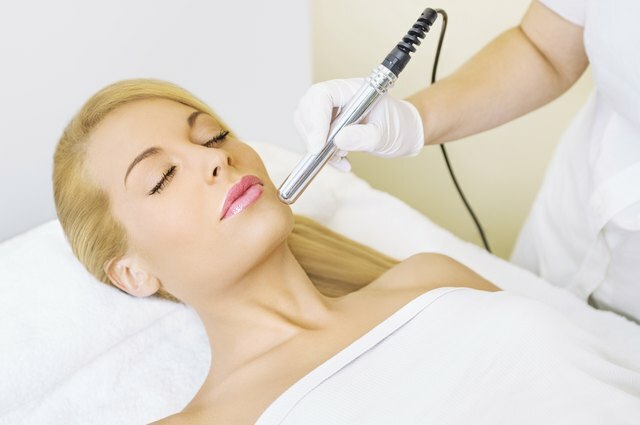 A diamond peel treatment is a mechanical exfoliation technique similar to microdermabrasion. This noninvasive cosmetic procedure removes excess oil, dirt, and dead cells on the surface of the skin to reveal the younger, brighter skin cells underneath. A diamond peel can improve the appearance of fine wrinkles and lines, even out a patchy complexion, and reduce mild to moderate acne breakouts. Like microdermabrasion, a diamond peel removes the stratum corneum, the layer of dead cells that makes up the uppermost layer of the epidermis. However, while microdermabrasion uses a sandblasting tool to shoot tiny aluminum oxide crystals at the surface of the skin, a diamond peel is crystal-free. The instrument used in a diamond peel has an abrasive diamond tip that gently loosens the dead cells, dirt, and debris while the wand's suction component vacuums them away. The diamond peel can more easily treat some problem areas, such as crow's feet and lip wrinkles, than traditional microdermabrasion can. Since the diamond peel doesn't use crystals, a dermatologist can maneuver the wand near sensitive areas without the risk of crystals getting in the eyes or mouth. There's also no risk of crystals lodging into or tearing the skin. You can safely undergo the diamond peel in conjunction with other skin treatments, such as a photofacial or the use of a retinol product. The diamond peel procedure is painless and lasts about 45 minutes. You can apply makeup and resume normal daily activities directly afterwards. Potential side effects are minor; they include mild redness and feeling like you have a mild sunburn. These symptoms last only a few hours. Some people with acne or recently shaven skin might experience some bleeding with the procedure. Those with inflamed acne or other broken skin conditions should not get the treatment. After a diamond peel, your skin may feel tight and dry, so keep skin well-hydrated with a quality moisturizer. Also, avoid extended sun exposure for five to seven days after treatment, and wear an SPF 30 sunblock when outside. Many people notice an improvement in their skin after two or three sessions. However, for best results, schedule a series of six to ten treatments—one every two to three weeks. After the initial series, you can scale down to a session every one to three months to maintain the results.